Mechanical Engineering without production and manufacturing is meaningless and inseparable. Production and manufacturing process deals with conversion of raw materials inputs to finished products as per required dimensions, specification and efficiently using recent technology. The new developments and requirements inspired us to think of new improvements in air conditioning Engineering field. Nowadays heater as well as cooler is available in market separately. Hence we decided to take over both applications in a same system. It’s a new step ahead in air conditioning Engineering field. Our project fulfilled all our requirements as our thoughts. Heater can be used in winter and cooler in summer. Hence it is a multipurpose project. Our project is vital one to the environment. In our project, solar power is stored in a battery. This power is used to run the air collar when ever we required. The water heater works with a separate A.C supply. Solar energy means all the energy that reaches the earth from the sun. It provides daylight makes the earth hot and is the source of energy for plants to grow. Solar energy is also put to two types of use to help our lives directly solar heating and solar electricity. Solar electricity is the technology of converting sunlight directly in to electricity. It is based on photo-voltaic or solar modules, which are very reliable and do not require any fuel or servicing. Solar electric systems are suitable for plenty of sun and are ideal when there is no main electricity. Our objective is to design and develop a solar system normally “SOLAR AIR COOLER WITH HEATER”. Human beings give off heat, around an average of 100 kcal per hour per person, due to what is known as ‘metabolism’. The temperature mechanism within the human body maintains a body temperature of around 36.9 degree C (98.4degree F). But the skin temperature varies according to the surrounding temperature and relative humidity. To dissipate the heat generated by metabolism in order to maintain the body temperature at the normal level, there must be a flow of heat from the skin to the surrounding air. If the surrounding temperature is slightly less than that of the body, there will be steady flow of heat from the skin. But is the surrounding temperature is very low, as on a cold winter day the rate of heat flow from the body will be quite rapid, thus the person feels cold, on the other hand on a hot summer day, the surrounding temperature is higher than that of the body, and so there cannot be flow of heat from the skin to the surroundings, thus the person feels hot. In such a situation water from the body evaporates at the skin surface dissipating water from the body evaporates at the skin surface dissipating the heat due to metabolism. This helps in maintaining normal body temperature. But if the surrounding air is not only hot but highly humid as well, very little evaporation of water can take place from the skin surface, and so the person feels hot and uncomfortable. The solar panel is converting sun rays to the Electricity by “Photo-Voltaic Effect”. This electrical power is stored in a 12-Volt battery. Battery D.C power is used to run the D.C motor and D.C water pump. Block diagram, Photo-voltaic Effect and major components of our project are already discussed above chapters. The D.C motor is coupled with impeller blades. The D.C motor runs during the air cooler button ON, the impeller blades starts rotating. The water pump is used to circulate the water to the blower unit. The forced air is flow through the water which is sprayed by water pump, so that the cold air produced. The switch control is used to ON/OFF solar air collar circuit and heater circuit. The Heater consists of heating element and single phase power supply. 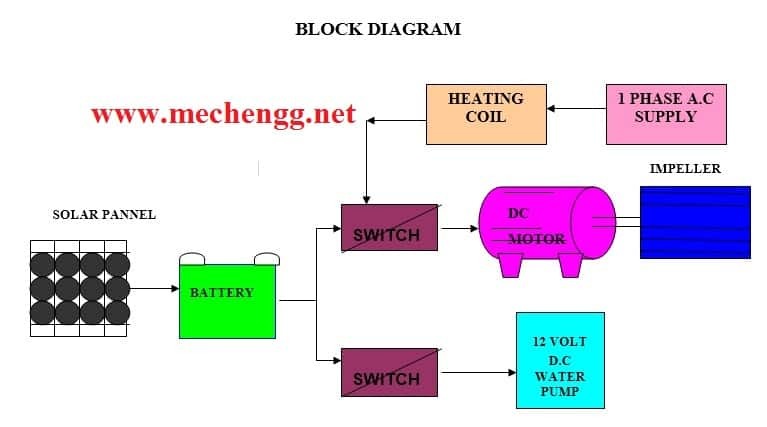 The single phase power supply is given to the heating coil, so that the coil produces hot flame. This hot flame is rashly forced out by the blower. The solar panel stand and complete diagram are given below. By adding control circuit, we can maintain the room temperature at required level. « WATER PUMPING SYSTEM AND POWER GENERATION BY USING WIND POWER AND PEDAL POWER.